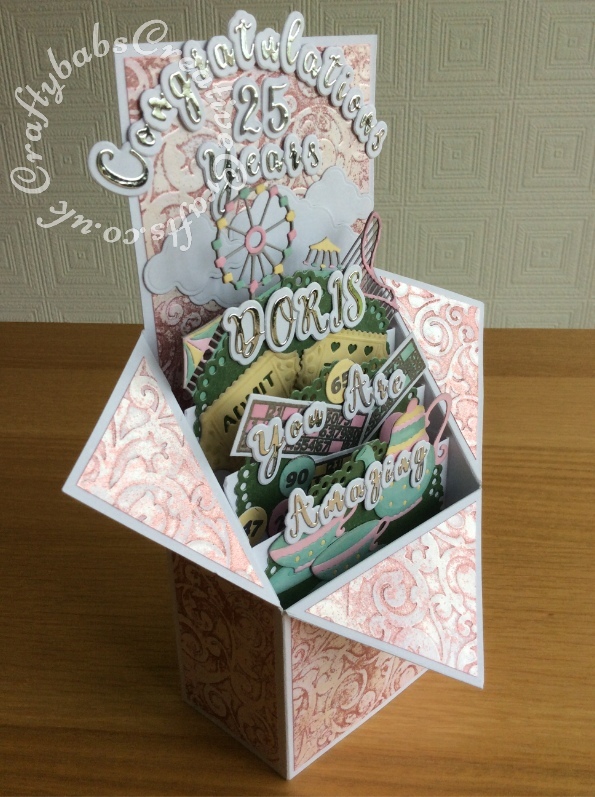 Pop up Box Congratulations card made using various dies including; Nellie’s Multi Frames Dies Doily Flower MFD020, Crafters Companion Gemini Expressions Metal Die – Uppercase and lower case Alphabet and number Sets, scenic dies free gift from issue 39 of Die Cutting Essentials magazine, SIZZIX SIZZLITS TEATIME Set 654787, HELZ CUPPLEDITCH DIE – FUN FAIR – TICKET dies, cloud dies from various Xcut build a scene All Aboard die set. Mats and layers on base card embossed with Embossalicious A4 embossing folder, then pearl fininsh addes using Cosmic Shimmer gilding polish accented with Cosmic Shimmer Glitter Kiss. Bingo cards and numbers stamped and embossed using La Pashe flippin bingo stamp set.